Located on the Gulf of Mexico, Naples nurtures a small town feel that caters to tourists and locals alike. Naples remains relatively warm all 12 months of the year and boasts pristine beaches that are famous for their white sands. Fisherman flock to Naples, as the water offers up good fishing year round. In addition, a plethora of premier golf courses succeeds in drawing men and women from all around the world to play 18 holes. Naples cuisine incorporates flavors from all around the world and ranges from casual and fun to elegant and refined. 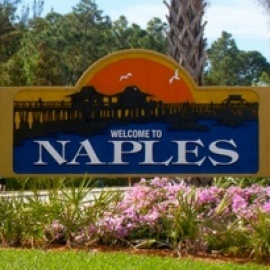 Naples offers a state park to visit, museums to explore and a local zoo. For lovers of the outdoors, several camping accommodations are available and camping permits can be obtained free of charge at the local Gulf Coast visitor center. In addition, adventuresome excursions into the Everglades can be arranged in order to explore the jungle in a bonafide Safari Wagon. For the traveler that does not wish to pitch a tent, Naples offers accommodations that range from modest to outlandish and local resorts can offer pampering as well as high-end lodging. A number of festivals are celebrated every year, which can feature anything from fresh seafood to racing canoes. The arts are not ignored in Naples, where theatres and galleries exist in which to nurture the artistically inclined soul. From quaint old hideaways to upscale boutiques, Naples has something to offer anyone itching to make a few purchases. There are even a large number of shops located right on the waterfront, which encourages shoppers to take their time and drink in the beautiful surroundings.